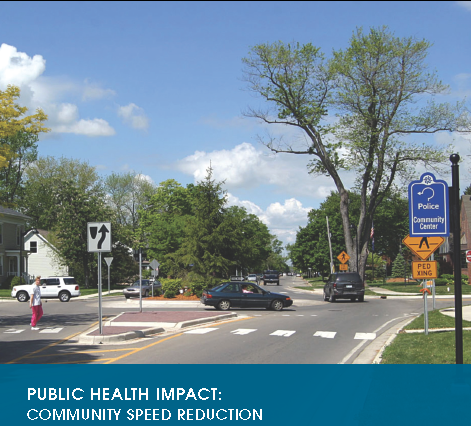 Health Resources in Action recently created a new webpage of community Speed Reduction resources with plenty of ideas for neighborhoods hoping to slow down traffic on their street. In addition to two brief fact sheets (Public Health Impact: Community Speed Reduction and Speed Reduction Fact Sheet: Opportunities to Improve Current Practice ), HRIA has put together a more lengthy technical report that provides a nice summary of the state of the practice and outlines key public health concerns related to speeding. 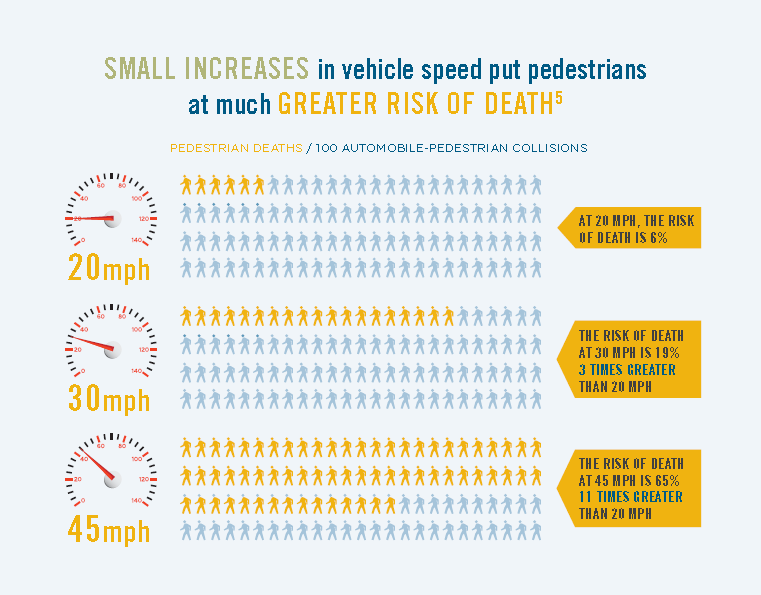 Most advocates are aware that higher speeds lead to more severe injuries and fatalities, but the numbers bear repeating: the average risk of severe injury for a pedestrian struck by a vehicle is just 10 percent at an impact speed of 16 mph, but quickly reaches 50 percent at only 31 mph. There are real costs associated with speeding crashes as well. According to the technical report, the cost of speeding-related crashes is estimated at over $40 billion per year, and a single fatality costs $6 million. Moreover, vulnerable (low-income, minority) communities disproportionately affected, as are young, old, disabled--people less likely to be able to recover from the financial challenges created by a speeding fatality. The report points to three key factors. First, road design: roads that are designed to be "forgiving" to drivers (wide lanes, no on-street parking, no landscaping or street furniture to run into) provide cues that encourage drivers to speed, often without even realizing it. These physical features are far more important to driver than incidental features like, oh, speed limit signs. As the report puts it, "...a road that is designed to be driven at high speeds will be driven at high speeds, despite posted speed limits." Land use may also play a role in speeding. The report highlighted one study that found that strip malls and big box retailers are major crash risk factors for bikes and pedestrians. On the other hand, commercial areas designed at a pedestrian scale lessen the risk of crashes. Finally, the report cites a culture of speeding as a major part of the problem. More than 70 percent of drivers speed--despite the fact that most people say they disapprove of speeding. This is particularly true for speeding in residential areas, where nearly 90 percent of people "frown upon" speeding but almost half admit to speeding themselves. Design and retrofit road networks to ensure safe speeds for all road users (motorists, cyclists, and pedestrians), using techniques such as traffic calming or slow zones. Use automated technologies to enforce speed limits. Set speed limits for the safety of all road users. They also provide six case studies of communities that are implementing these strategies. Over the next few days we'll review the findings from these studies to learn how you might apply them in your own neighborhood. Personally I like speed cameras, but understand that they can be a politically difficult sell. If you read the post about how Washington DC implemented their cameras, I think you'll see that they had a good approach, building community support/buy-in before installing the cameras and making it a real partnership (not just the government trying to make money off tickets!). The automated speed display board works too, as long as it's used consistently (if it's temporary, the effects tend not to last as long).